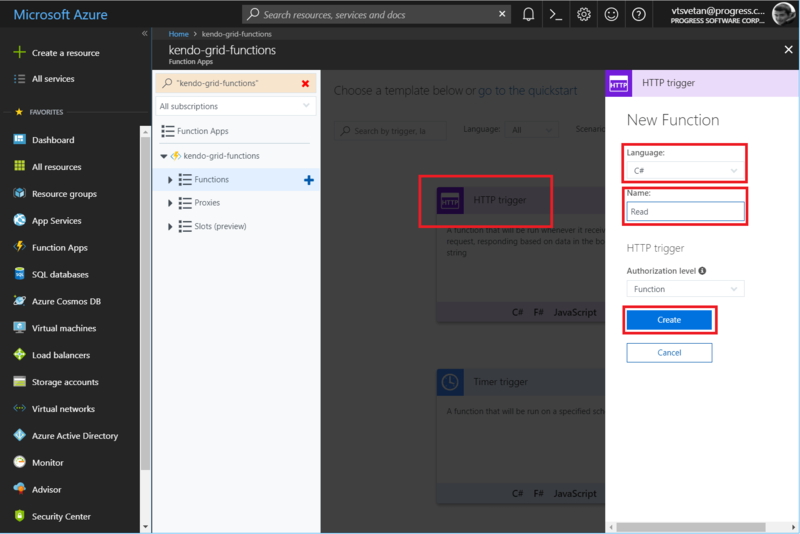 This article provides a step-by-step tutorial on how to configure Azure Functions to serve data for a Kendo UI Grid. 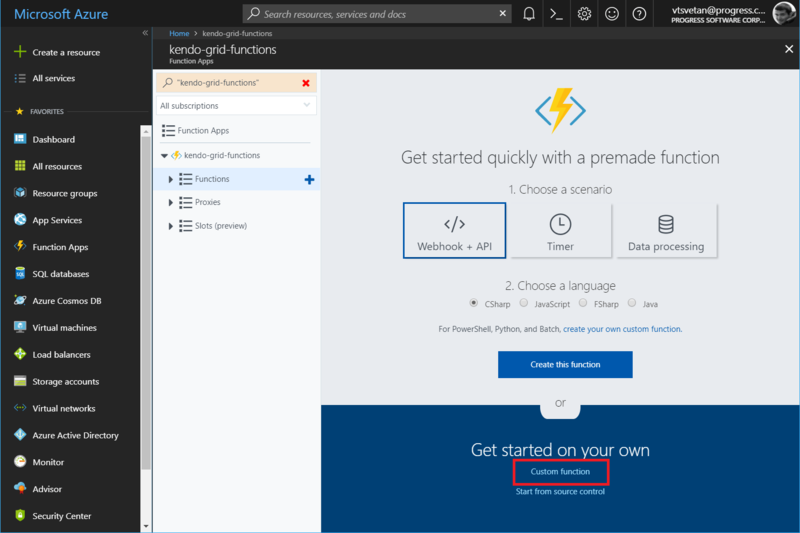 Follow the steps from the Create your first function in the Azure portal > Create a function app quickstart. Provide the kendo-grid-functions name to the application and set the name of the storage account to kendogridfunctions. 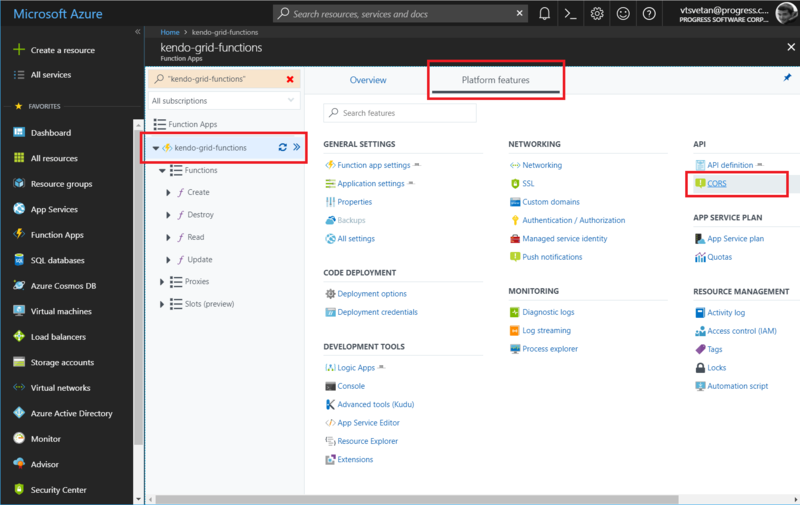 In Azure Portal, go to the newly created kendo-grid-functions application. You have to apply the following steps individually to set each function (read, create, destroy, and update). On the left-side panel and under the application name, click the + (plus) symbol which, when the Functions section is hovered, appears to the right. If the Get started quickly with a premade function screen appears, click the Custom function link at the bottom. Click the HTTP trigger option. On the panel that appears to the right, select the language and fill in a meaningful name for each function. 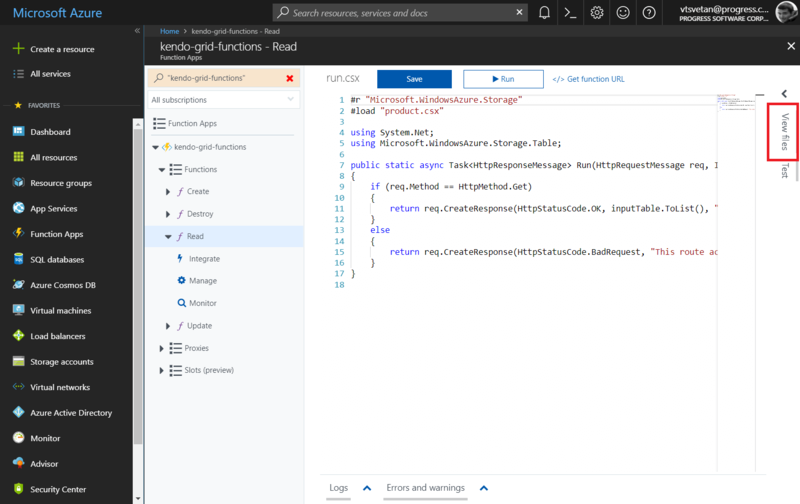 Later on, the tutorial will demonstrate how to implement the Azure Functions in C#—therefore, select that language—and will use Read, Create, Update, and Destroy as names for the four functions. Expand the Read function and, under the function name on the left navigation panel, click the Integrate section. In the Inputs section, click the New Input button. 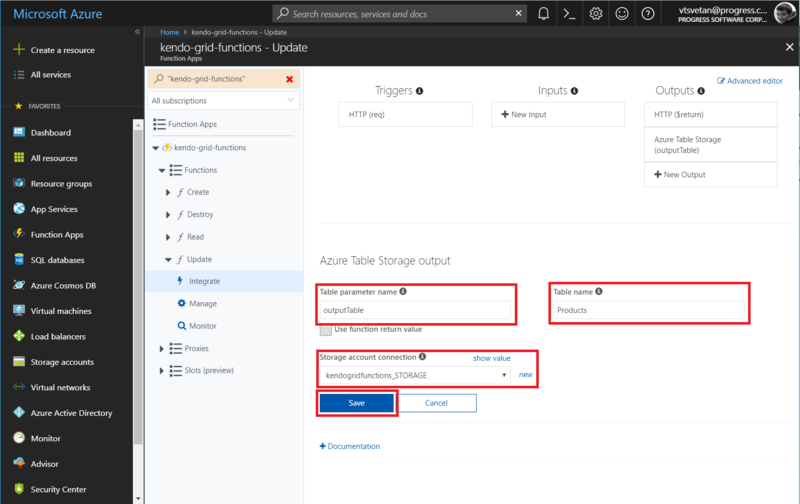 Select Azure Table Storage as the input storage that will be integrated and click Select. Type Product for the partition key of the table. Chose the maximum number of records to read. In this case, the default value of 50 will be preserved. In Storage account connection to the right of the field, click the new link. 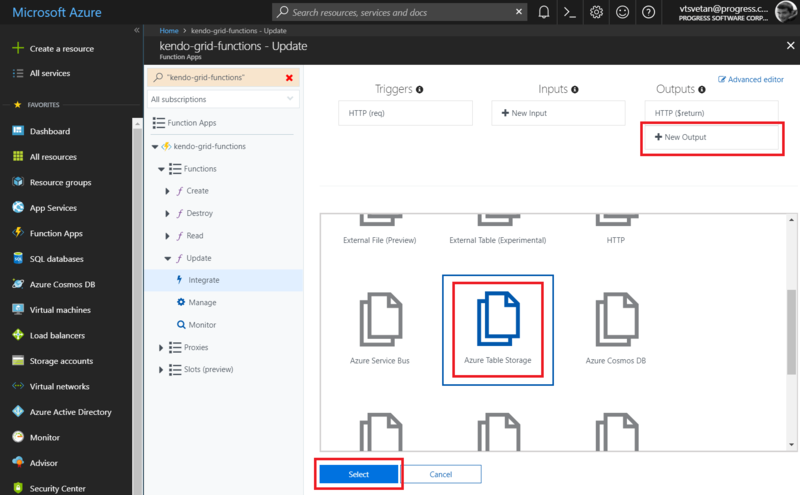 Select the kendogridfunctions connection that was created during the initial setup of the application. Change Table name to Products. Click Save to save the newly integrated input table. 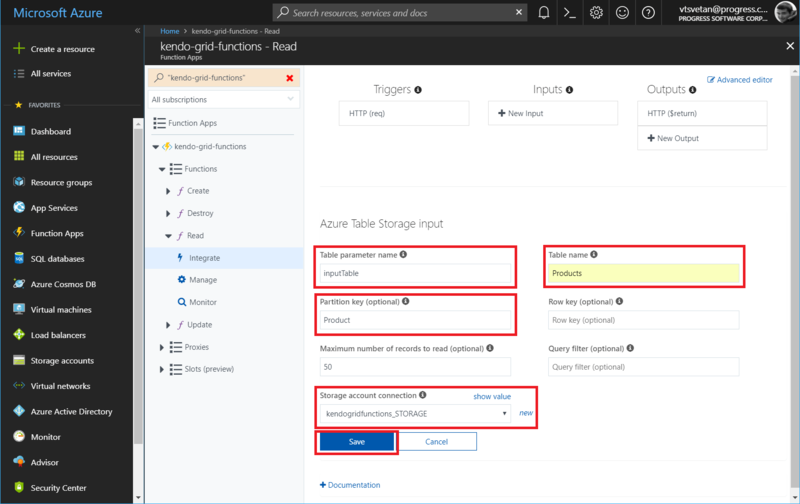 Select Azure Table Storage and click Select. 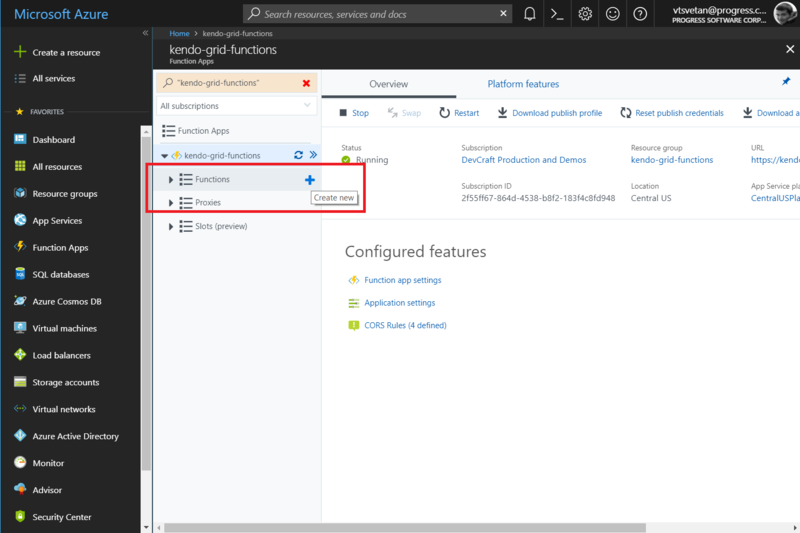 Select kendogridfunctions_STORAGE for the storage account connection. Click Save to save the newly integrated output table. Click the Add button and provide the product.csx name to the new file. Under the Read function, open the run.csx file. Before the initial use, include the following load directive that allows you to use the Model class definition in the actual function. 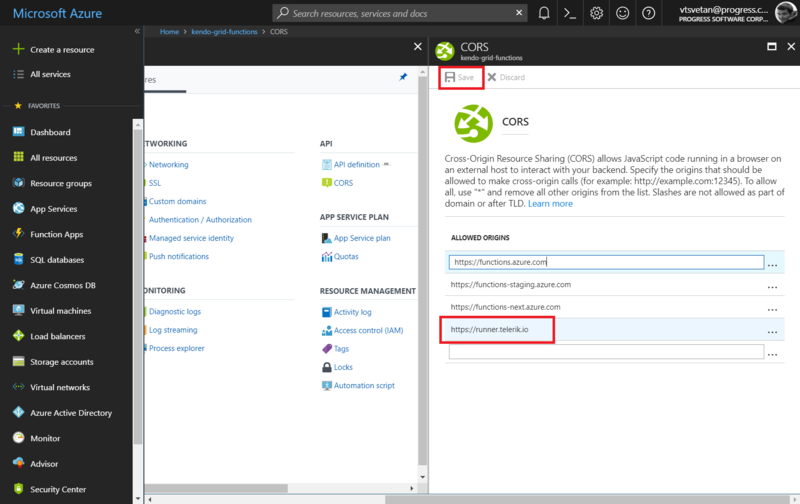 Include a reference to the Microsoft.WindowsAzure.Storage and a using configuration for the Table library. Modify the definition of the Run function method. The newly added inputTable parameter allows you to get and return the products that are stored in the integrated table storage. Now you can proceed with the implementation of the other three functions. Make all three of them load the Product class and refer the Microsoft.WindowsAzure.Storage and Newtonsoft.Json assemblies. Add the respective using configurations. As a result, the Run methods for each function differ. The following example demonstrates the Run method for the Create function. The following example demonstrates the Run method for the Destroy function. The following example demonstrates the Run method for the Update function. As the implementation is already in place, now you need to add specific configurations to the application and for each of the four functions. Click the application name and select Platform features. Under the API section, click CORS. Add the domain origin of the client-side application that will consume the functions data and click Save. In this case, the client-side application will be located in the kendo UI Dojo. Therefore, the https://runner.telerik.io origin is available. Go to the Read function and open the function.json file. In the bindings / methods section, remove post as an option. Open the same file for the other three functions but remove the get method. Get the unique URL for each of the functions by clicking the Get Function URL link that is available for each of them. Now you need to implement the client that will consume the data from the functions application. The following example demonstrates how to implement the Kendo UI Grid and place the proper endpoints of the CRUD operations in the transport configuration of the data source. 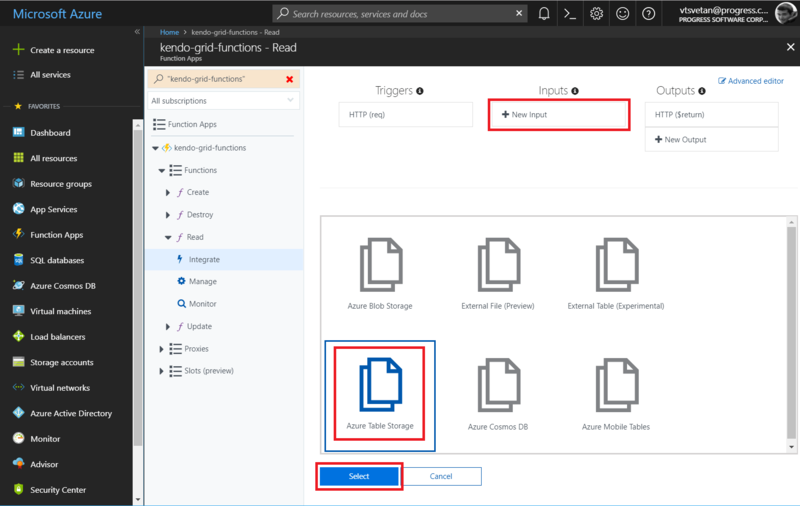 As a result, the Grid will be able to consume and edit the data from the Azure Functions application.